VeriCite DocumentationUser GuidesCanvas User Guide New Canvas Plagiarism Detection Framework Integration - Admin ArticlesHow do I grant VeriCite Admin permissions but not Canvas Account Admin permissions to a user? 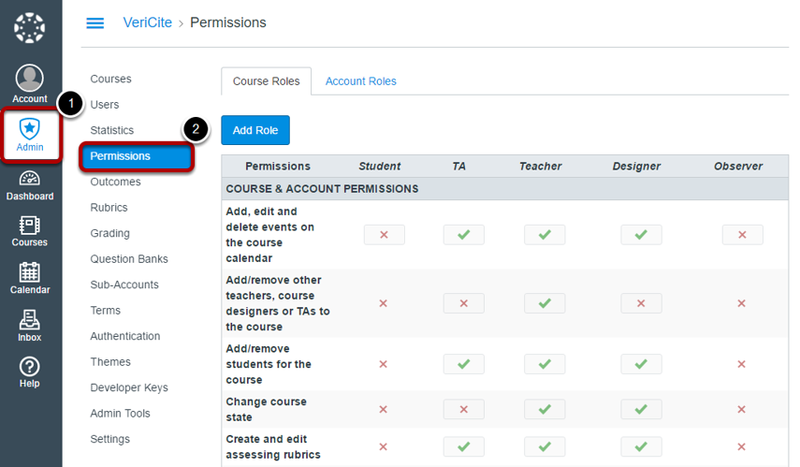 In order to access the Admin tab and use the administrator features of VeriCite, you need to have admin permissions in the LMS. However, in some cases, institutions may want to provide VeriCite admin access to specific users so that they can run reports and perform other VeriCite admin tasks without allowing those users administrator rights to other areas of the institution's Canvas LMS. This guide describes the process of creating a new role for VeriCite-only admins, and assigning the role to users. Creating a VeriCite Admin role. Log in as the Canvas Admin and go to Permissions. Zoom: Log in as the Canvas Admin and go to Permissions. 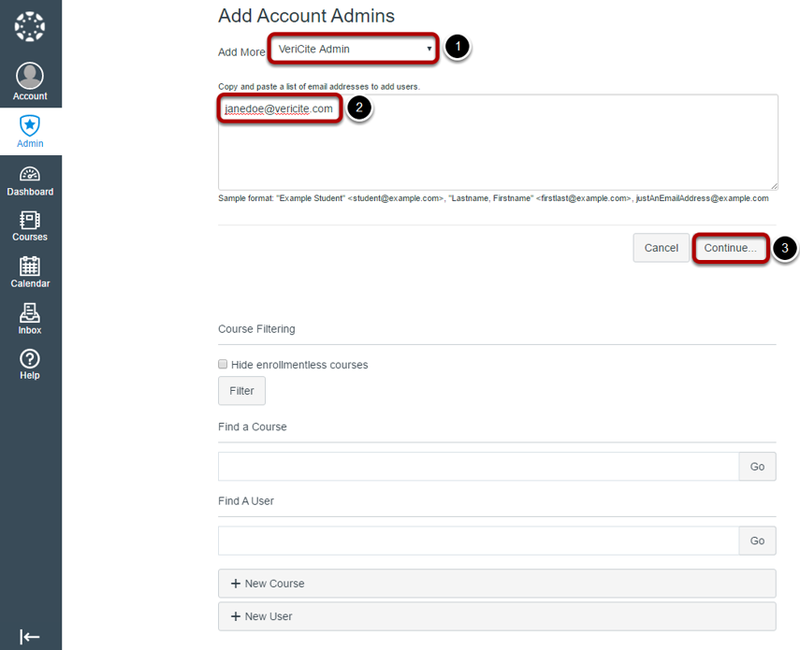 Select Account Roles and then click Add Role. 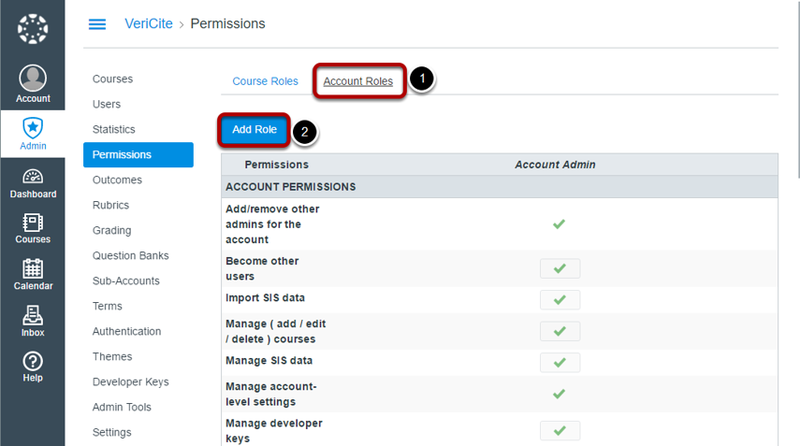 Zoom: Select Account Roles and then click Add Role. Name the new role and click Save. Make sure that the VeriCite Admin role has no permissions. 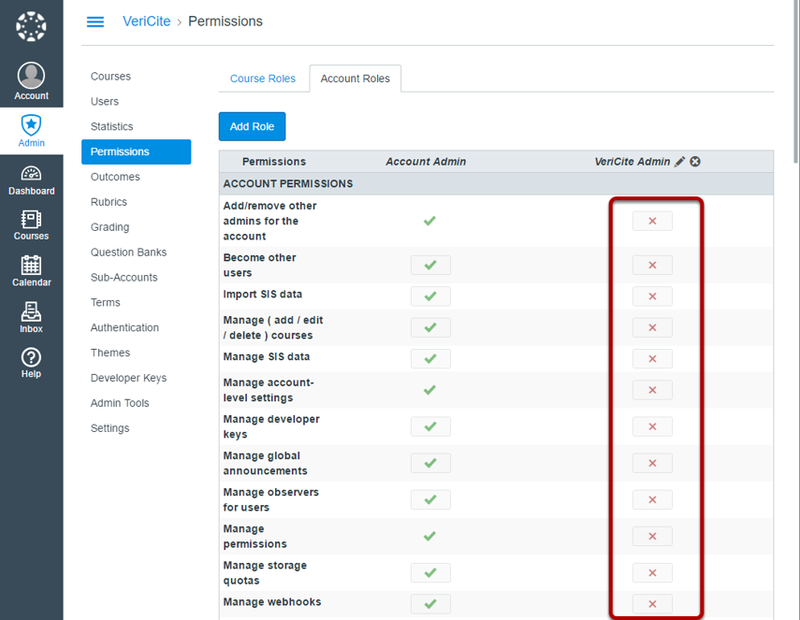 Zoom: Make sure that the VeriCite Admin role has no permissions. You should see a red X in the new column for your VeriCite Admin role. By default, no permissions are assigned. Leave this default setting so that the new role does not have any Canvas account admin permissions. Assigning the VeriCite Admin role to a user. 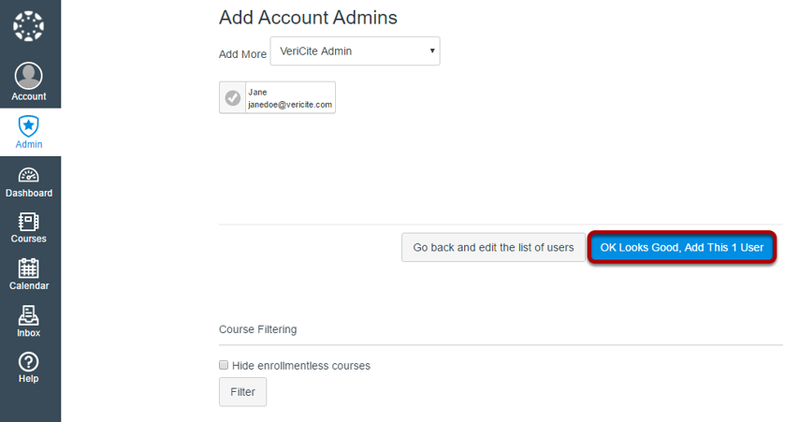 Now that you have created your VeriCite Admin role, you need to assign it to the user or users that will be utilizing it. Go to Settings and select the Admins tab. Zoom: Go to Settings and select the Admins tab. Zoom: Click + Account Admins. Specify the role and user to be added. Zoom: Specify the role and user to be added. Select the VeriCite Admin role from the Add More drop-down menu. Enter the email address for the user account to be added. Note: If you do not know the user's email address, you may use the Find a User option to search for an existing user account and view the account details. Or, if the user does not exist, you may click the + New User option to create a new user account. Click the OK Looks Good, Add This 1 User button. Zoom: Click the OK Looks Good, Add This 1 User button. 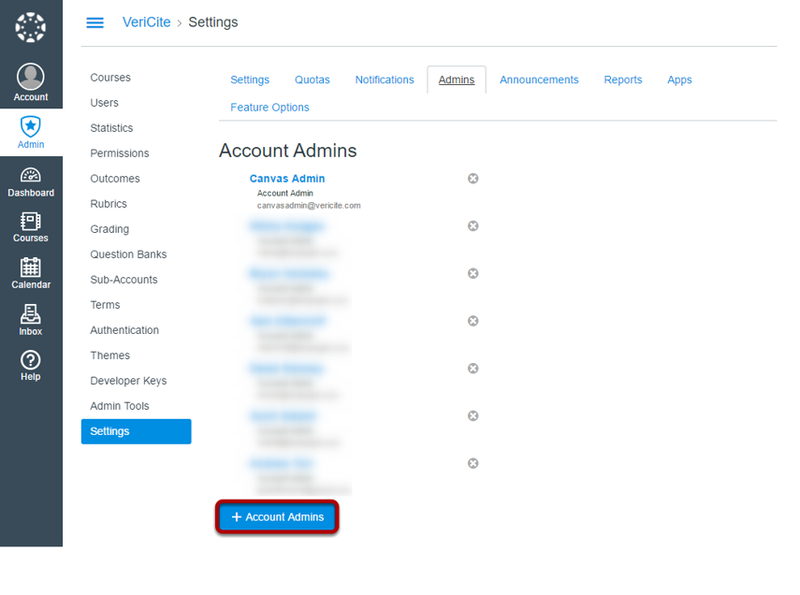 Your VeriCite Admin has now been added. Zoom: Your VeriCite Admin has now been added. 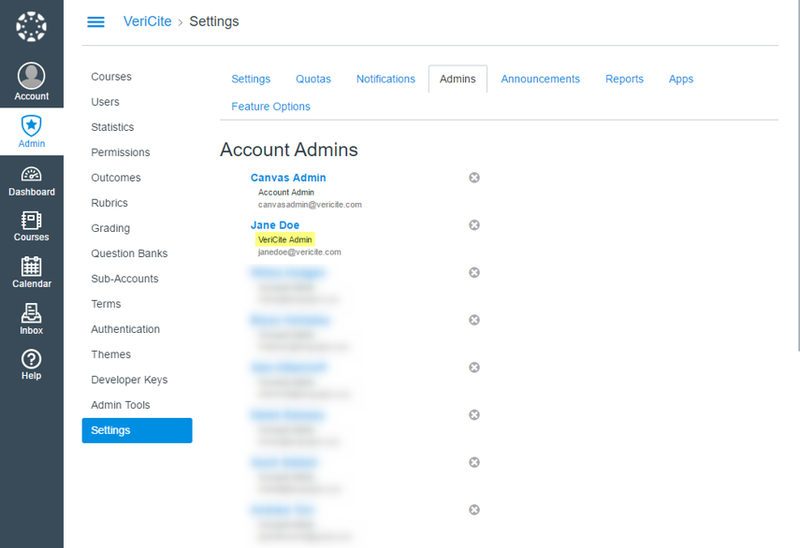 Notice that the role is shown as VeriCite Admin, and not Account Admin. 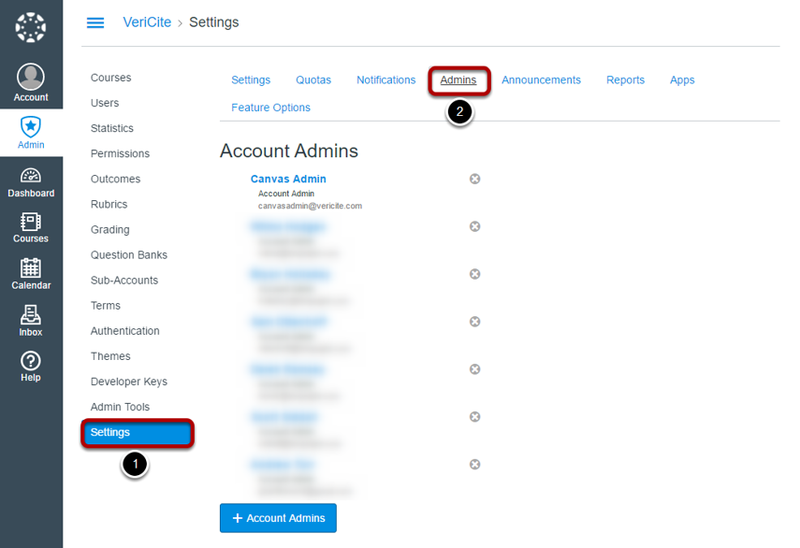 Note: Please see the How do admin users access VeriCite Admin features? for additional instructions on how to access admin statistics and reports.